1. Television is a publishing medium — it qualifies by the key definition that remains at the core of the philosophy of this site: “To make publicly or generally known; to declare or report openly or publicly…” To categorize TV as just an entertainment medium ignores two factors. Book and periodicals are also often read strictly for their entertainment value. And television news (although it often appears like a sitcom) is an information source that remains a primary (if declining) attraction for TV watchers. 2. Television viewership is now undergoing a similar extent of disruptive changes that are affecting all other forms of publishing. Most are based on specific new technologies, such as the growth of cable TV, Internet video and TV broadcasting, iPods with video, and digital recording devices that can zap commercials, the lifeblood of most broadcast television. 3. 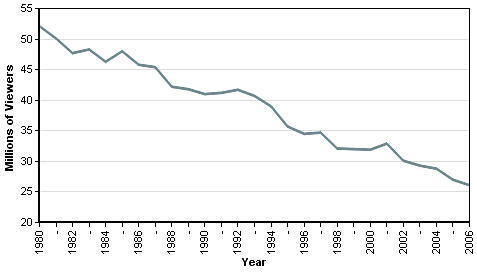 And as with other media, television viewership is profoundly affected by the changing habits of a new and younger demographic, one that no longer necessarily looks to TV as the apex of visual media delivery, although, as noted below, the importance of the youth demographic can be overstated. 4. The statistics show that some aspects of television viewership are down, and the challenge is ongoing, although the full extent of the change is a confusing and fast-changing phenomenon. There is a multitude of data suggesting very different outcomes, as will be illustrated below. 5. Advertising revenue is dropping for network television, but increasing for cable. Television streamed to PCs and mobile devices is becoming an increasingly viable alternate revenue source for broadcasters. Television isn’t going away any time soon. The television networks are beginning to rigorously adapt to delivery to new formats and devices. This is all to the good. But the core traditional essence of what made TV successful for so long – programming with frequent commercial interruptions – surely has a limited lifespan. My prognosis for the future of television, certainly as we understand it today, is short-term negative. Whether the industry can fully adapt to the seismic changes that now assault it remains to be seen. This section covers both television and online video (as it specifically relates to television). I cover the movie industry separately. This section also has a specific focus on television journalism, and is best read in conjunction with the section on Newspapers. No discussion of television broadcasting can skirt around the issue of advertising. Traditional network broadcast television was 100% funded by advertising: the viewer paid no subscription or service fees (just the price of the television and, in my youth, the price of the large receiving antenna and the cost to have mounted on the roof of your little house). Of course, like nearly all of the publishing media examined on this site, television is going through cataclysmic changes. It started many years ago with the growth of the cable networks, which for the first time challenged and then splintered the hegemony of the big three U.S. networks (ABC, CBS and NBC). The impact of cable television was at first gradual, but now is one of the forces that has completely altered how the business of television is conducted in the United States. The chart below, from Nielsen Media Research, illustrates the decline in viewership of the big three networks. Digital satellite broadcasting extends just one aspect of the cable phenomenon. While there is no original television broadcasting for digital receivers, if defined in the same manner as original digital radio broadcasting (see the Industries section on Radio), satellites further the trend to providing viewers with such a plethora of viewing choices that it has become increasingly difficult for advertisers to figure out how to successfully target specific audiences. The next blow was the digital video recorder phenomena, first a contest between Relay and TIVO, but now a technology far more widely available in a range of comparable devices. The big hit for television broadcasters in this technology is that it makes it simple for viewers to skip watching commercials. We’re used to the idea now, but consider how dramatic the impact was on both advertisers and broadcasters as the technology spread at the beginning of this decade. What if you could attach a chip to magazine or newspaper and make the all of the advertising disappear as you flipped through the pages. What if you could buy special lenses for your glasses that miraculously blanked out all outdoor advertising so that you could stroll down the street without perceiving the thousands of advertising messages we are bombarded with daily (albeit now, somewhat remarkably, without concern or anger – humans can get accustomed to just about anything). Television advertising is different from other forms. We can train ourselves to some extent to selectively filter our view of the advertising in print publications and outdoor advertising. Not so with traditional television. You’re watching a film or series, often enjoying it thoroughly, often completely engrossed. The narrative comes to a sudden halt, and you’re taken to another world, generally one completely at odds with where you just visited: a new subject matter, an exaggerated tempo, intrusive musical themes, fast voiceover and so on. The only wonder is that people did not find a way to rebel sooner. One of the first ways that TV networks retaliated against this insult was to begin broadcasting all (or usually a portion) of their content directly to the Internet, and then peppering these sections of their sites with Web advertising that could potentially replace some of the missing broad cast revenue. A 2007 report from the Motion Picture Association of America, “Entertainment Industry Market Statistics,” includes this telling chart prepared by Veronis Suhler Stevenson. While the graphic actually references a broader range of media than just television, it point clearly to the fact that the in TV as is the case elsewhere, consumers are opting to take control of their entertainment diet, rather than allowing advertiser-dominated networks to dictate it. The growth of video on the Internet is certainly related to television, although it has numerous characteristics all its own. According to an article by Marisa Gallagher in Fast Forward: Designing for Constant Change (PDF), “almost 4 billion minutes of human time are devoted to watching videos on YouTube per month, according to recent MediaMetrix reports. While that’s 18 billion minutes short of the time spent on Yahoo! Mail, and 3 billion short of the time whiled away on Yahoo! Messenger, it’s a whopping 1.5 billion more minutes than people spent searching Google. On the other hand, Ben Macklin, a senior analyst at eMarketer takes a contrarian view in his March 2008 article, “Online Video Will Not Replace TV.” According to Macklin, “just because consumers are currently watching free, short-form video does not necessarily indicate there is a viable business model to support viewing of traditional TV content online. Most of the evidence available suggests that online video content is supplementing and complimenting traditional TV content and viewing habits rather than replacing or supplanting them. Online and downloaded video is having a huge impact on the publishing and consumption of moving images, but I’m inclined to side with Macklin: this is a completely new phenomenon, not necessarily a predictor of the future of television. “‘People don’t understand that time is hydraulic,” he said, meaning that time spent on the Internet is time taken away from other activities. Likewise a Forrester Research report, “The State Of Consumers And Technology: Benchmark 2005,” claimed that broadband Internet users watch just 12 hours of TV per week, compared with 14 hours for those who are offline. Since these reports and statistics emerged, others are supplanting them that contradict their grim outlook. An essential fact is that most people prefer to watch all forms of digital video, broadcast or otherwise, on their increasingly-sophisticated home TV-audio entertainment centers, rather than on their computers, which generally feature smaller screens and are not situated for the same comfort of viewing. The amount of time American sit in front of their TV sets is increasing, not decreasing, even if not all of that time is spent with network or cable television. 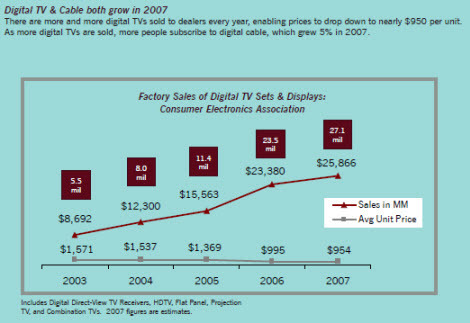 From a 2007 report from the Motion Picture Association of America, “Entertainment Industry Market Statistics,” comes the chart below illustrating both the increasingly household investment in state-of-the-art digital TVs with the associated growth in subscriptions to digital cable. I refer to the “zero-sum game” of media consumption. There are only 24 hours in a day. While the phenomena of younger people employing multiple media at one time: for example, chat, TV, telephone, music, etc., is well-documented, I view this more as a “kid in the candy shop” transitional phenomena than a long-term trend. As human beings we have limited bandwidth with which to absorb media. We can divide our attention or focus it. “The Television Bureau of Advertising (TVB) is the not-for-profit trade association of America’s commercial broadcast television industry. Its members include television broadcast groups, advertising sales reps, syndicators, international broadcasters, associate members and over 500 individual television stations.” You’ll find lots of reports outside the member firewall, not all of them exclusively trumpeting the power of TV advertising. 3. As mentioned elsewhere on this site, and in a recent blog, The Project for Excellence in Journalism (PEJ) is a well-funded independent research organization operated by the Pew Research Center in Washington, D.C. Its website offers a plethora of analysis, reporting and commentary. But keep in mind that its focus is “understanding news in the digital age,” rather than the entire dynamics of the medium. PEJ’s flagship report is its annual State of the News Media. The 2008 edition was published on March 17th, 2008. The report covers not just newspapers, but television, magazines, radio, online and more. The sections on television are divided into three parts, network, cable and local. A very thorough study! 4. Who’s Consuming TV on the Web — and What Does this Mean for the Future? This Nielsen Online 32-page PowerPoint presentation from February, 2008 offers numerous insights into the questions posed by its title. This May 27, 2008 article in The New York Times points to a challenge for television that doesn’t receive much airplay. The article’s lede: “Nearly 25 million homes have at least one television set that will stop functioning in nine months, when the nation converts to digital over-the-air television. The author, Brian Stelter, reports that broadcast television stations will be switching en masse to digital signals from analog signals on Feb. 17, 2009. This won’t impact TVs connected to cable or satellite services, but older television sets that receive antenna signals will need to be hooked up to a converter box. Sony plans to offer video downloading through all of its key products, including televisions, computers, music players, and videogame devices, over the next three years. And who said convergence is dead? As the article points out, Sony is in a unique competitive position because it also owns both a movie studio and a record company, and so has a chunk of the content required to feed its next-generation digital devices.